There's something especially sinister about using a banal toy, like a wooden block, to illustrate cancer. But this is the approach World Child Cancer takes in "The Big C." Directed by Steve Cope, with masterful use of sound design by Munzie Singh Thind of Grand Central, the ad takes you on a journey from safe harbor to looming horror in 30 seconds. It starts in a cozy living room, where a blonde British girl is playing with blocks. The scene oozes comfort and security; a tea kettle whistles in the background, and the girl knocks her blocks over, sending them tumbling down with a satisfying muted clatter. But one block keeps going. It finds its way to the stairs, its size expanding as the sound it makes grows thicker and more threatening. The nicks and dents it leaves in the walls and bannister pay witness to its transformation from a small, cheerful object to something very dangerous. Following a sharp turn, the stairs go from wood to concrete, lined with dingy walls. What kind of family has a basement like this?! But the block keeps going, finally landing with shuddering finality on the dusty carpets of a house that can best be described as a shanty, where another girl, this one Indian, is playing with blocks. 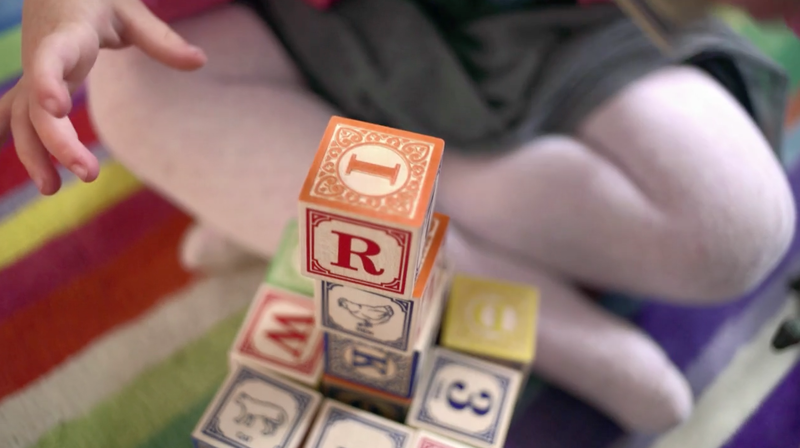 She looks up, runs over and gazes shyly up at the object, which towers over her with a single scarlet letter: C.
"In the U.K., a child diagnosed with cancer has an 80 percent chance of survival. In Bangladesh, it's only 10 percent," a narrator says, flashing the World Child Cancer tagline: "Let's help even the odds." "The complexity on this project came from ensuring that the sound of the wooden block grew bigger—to match the visuals—but in both a seamless and believable way," says George Castle, who worked with Thind on sound design at GCRS. "I'm very proud to have worked on this piece, not just because of the level of craft involved, but also because it's such a worthwhile cause." "As soon as I saw the storyboard for this, I knew we had to create something extremely special to work with the beautifully simple visual idea," says sound designer Thind. "Ultimately what I wanted to achieve was giving the audience goosebumps, immersing them in the story." Cope and Thind have a shared history of using sound design to tell stories with socially important and emotional messages. In 2014, they collaborated on "Sensory Overload" for the National Autistic Society that hypnotically showed us what sensory overload feels like. For all the medical advances we've made, we're nowhere near resolving the ravage of cancer, especially in countries with less access to resources. And the obliviousness of both children, notably the one who is doomed, makes the ad persuasive: It's easy not to think about "children somewhere else" when they're an abstraction, but not when you can see they are exactly like the ones we encounter every day, including our own; they need champions fighting in their corner. Childhood cancer has generally been a quiet subject, but has started to attract public awareness, in part because of strong efforts like this one to highlight its uniquely tragic quality: Cancer in general is monstrous, but worse still when it affects children. For another example of the emotional havoc it wreaks, check out That Dragon, Cancer, a video game created by a father whose son eventually died of brain cancer.